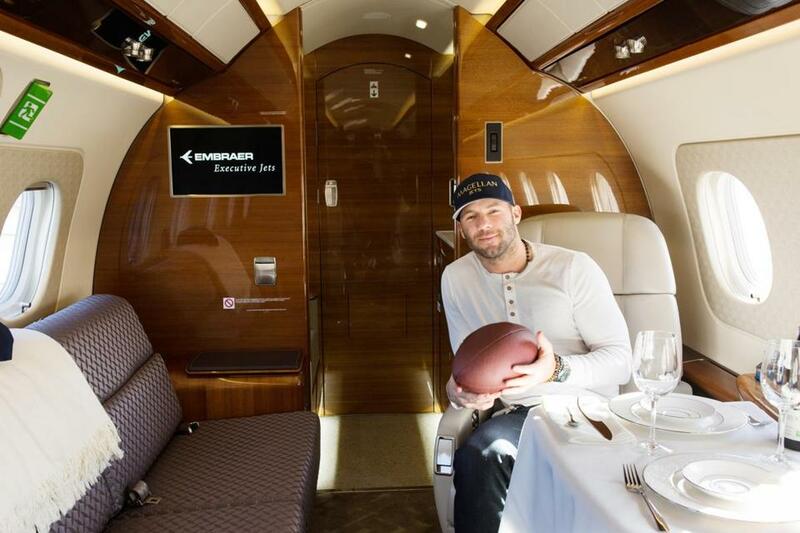 New England Patriots wide receiver Julian Edelman relaxes on a Magellan Jet. New England Patriots wide receiver Julian Edelman doesn’t need to fly coach. When you sign a two-year, $11 million contract, you can also afford to sail past business and first class and head to the next level — a private jet. When Edelman is ready to fly, he ponies up $4,000 (or more) an hour and charters a private jet through Quincy-based Magellan Jets. Think of Magellan as an ultra posh car service for the skies. The company connects customers with private jets that range in price from $3,960 an hour for a standard small jet to $12,800 an hour for a large Gulfstream G450. They can also customize your experience with add-ons. Going to the Super Bowl? They can decorate and cater your flight. Interested in a private jet to the Kentucky Derby? They’ll have the mint juleps ready when you board. Please keep in mind that these extras are not free. Last year, an injured Edelman chartered through Magellan for his flight to the Super Bowl in Minneapolis. The company waived the $28,000 round-trip fare as a goodwill gesture (this year he joined the team on AirKraft). But if you want to fly like Edelman to this year’s Super Bowl in Atlanta, all you’ll need is $20,000 for the round-trip flight. You can offset the cost if you have six friends willing to split the bill. There’s the glamorous celebrity side of Magellan Jets — we’ll get back to that shortly — but according to Anthony Tivnan, cofounder and president, the largest segment of the company’s customers come from the business world. Tivnan founded the company in 2008 with Joshua Hebert and Gregory Belezerian. According to the luxury travel group Virtuoso, trips chartered through private aviation companies increased 10 percent from 2014 to 2016, and the numbers have continued to climb in the years since. There are also a growing number of jet charter companies which are driving up competition and lowering prices. Lowering, relatively speaking, of course. Magellan added 190 customers in 2018, bringing its total close to 500. Tivnan stressed that Magellan isn’t simply about arranging flights for people. When individuals buy memberships — which are sold based on blocks of time — the company works with customers to determine what size plane works best and how many hours are necessary for their needs. You can purchase time in blocks ranging from 25 to 200-plus hours. An entry-level membership for a light jet that seats seven starts at $121,000 and can go into the millions depending on the plane size and number of hours. Magellan doesn’t own the jets. Tivnan said the company works with 90 different management companies that maintain about 2,000 aircraft around the country. Tivnan uses former Red Sox pitcher Josh Beckett as an example of how the company tailors experiences. When Beckett’s wife went into labor, he left a game in Baltimore, flew home on Magellan, and arrived at the hospital 20 minutes before his first daughter was born.